Sweet little baby vanilla orchid- the pale green sticky-outy thing is an epiphytic root. I never believed I could grow a vanilla orchid without a greenhouse- credit the Botanic Garden (again- I’m a little obsessed with the place). At the very end of my visit there with my wonderful MIL, we went to the learning center at the children’s section. This place isn’t quite a greenhouse, but it has large south windows. There was a display of herbs and spices, and an employee was working on a plant in a container- wrapping a long vine around a tower made of chicken wire with sheet moss inside. I asked what it was, and actually said “Squee” when he told me it was vanilla. In “Growing Tasty Tropical Plants,” (ooh, it’s overdue, need to renew it…) I learned that vanilla was not appreciably different from most of the tropical “houseplants” I currently have. Their major needs are something to climb on, filtered sun, and humidity. The cage the guy was working on at the Botanic gardens supplies two of those needs- something to climb and humidity, because the sheet moss can hold moisture and slowly release it. Filtered sun it can get on the back patio in the summer, and in the Boy’s room in the winter. 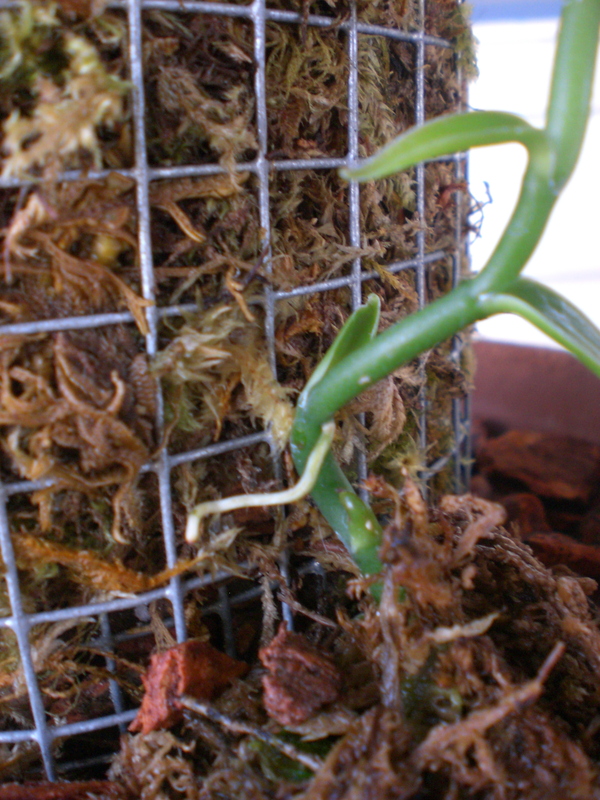 I went home and promptly ordered a vanilla orchid plant from eBay, then set about designing my own humidity trellis. Vanilla orchids don’t bloom until they get to be about 10 feet tall, but I didn’t want to create a ten foot tall cage, so I made mine modular, and figure the vine will wrap around, adding length without too much verticality. Once the vine gets to the top, I can make another tube, lash it on with cable ties, and be good to go. 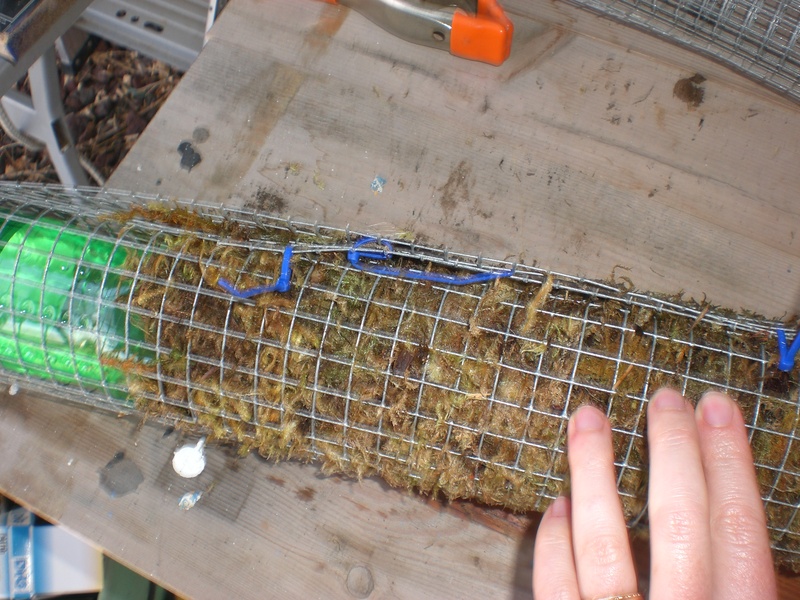 I used cable ties to connect the layers of mesh and sheet moss. I had a roll of hardware cloth in the garage, and as I sketched and thought about it, I decided to make it like a quilt, with two layers of metal mesh that overlap in the center, leaving about 6 inches on either end, and a layer of sheet moss in the middle as batting. I stitched it together with cable ties. The humidity is supplied by a 1 liter pop bottle that sits on the shelf made of the inner layer of wire. I poked pin holes in the bottom. When I fill it the water slowly drips down the tower, where it can evaporate. In my first bottle, I poked too many holes, and the bottle drained in about 10 minutes. Ideally, it would be much slower. I have adjust the tightness of the screw top, so it slows it down, but it isn’t quite dialed in perfectly yet. The benefit to using a pop bottle is, I just have to check the recycle bin to get another one, poke fewer holes, and experiment. I laid out about 12” of hardware cloth and cut it using wire cutters- I had to weigh it down so it would lie flat. 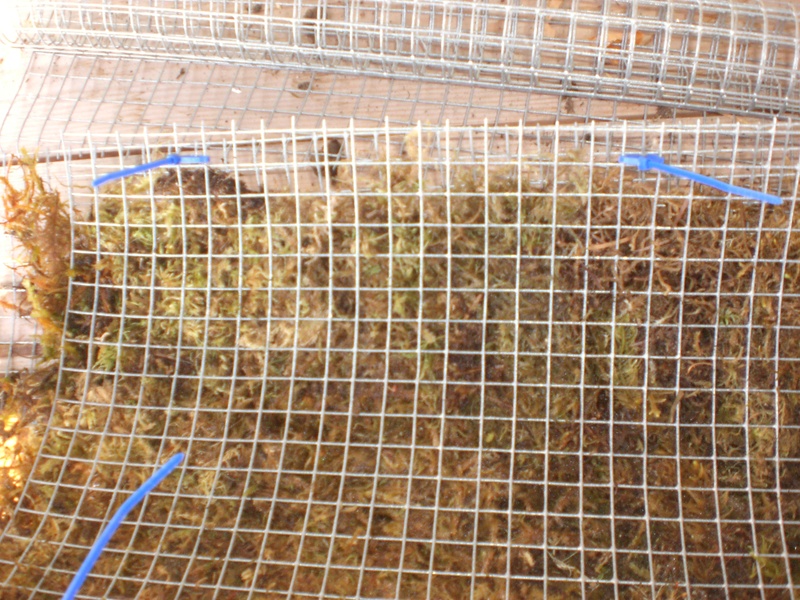 Lay out the green sheet moss- I got it wet so it would be easier to work with- I was outside on a windy day. I covered the bottom 18 inches of it but left the top bare. Quilt the layers together using cable ties. You could use wire for this, but I think it would be a pain- the hardware cloth wants to roll up, with cable ties you loop, then zip tight, and it goes pretty quickly. Usually my crazy frugality prevents me from buying something new for a project, but in this case, I went to the hardware store and bought cable ties- 2 dollars, and totally worth it. The bottle fits into the top, and the bottom goes into the pot for stability. Put the trellis into your pot- I used a 10” diameter clay pot, then filled it with orchid mix. This is when it would have been good to have a helper- the orchid mix is chunky, too chunky to fit through the holes in the mesh, so it would have helped to have another set of hands to stabilize it. I put the trellis in, filled in and around with orchid mix, then I put the plant in, and added orchid mix to fill in the rest of the way. The plant is only about 4 inches tall now- once there is no frost danger, I’ll put it outside on the patio and watch it grow. So…how is the vanilla plant doing so far? I just received two plants for Christmas and am looking for info on how to plant. Any info would be helpful. It is doing okay- not growing as fast as I had hoped, but not dead, either. It is inside for the winter, in a room with south and west facing windows, but out of the direct light. It is near a heater vent, so that’s why I think the humidity thing I built helps. It is also in a room with a fish tank, so that keeps it more humid, too. It does have new growth on it, it’s maybe 3 inches longer than when I first planted it. Good luck- you have a cool person giving you presents! I just purchased a vanilla orchid and like your idea to support it. I’m having a hard time visualizing the ends you are describing. Did you happen to take more pictures of the building process? Thank you! By this I take it on the outside of the trellis you only see the moss. But the inside is filled with the orchid mix? Then the bottle on top of that. Upside down. With the lid loosened to allow water to seep through. I’m going to bud mine out of 3 ft hardware cloth so that more of the footing can be in the pot. Hopefully to add stability to it. Or is the bottle right side up with holes in the bottom and the lid acting as a valve.